A charity that provides holiday accommodation for disabled people has received a massive boost – thanks to the efforts of two Bield tenants. 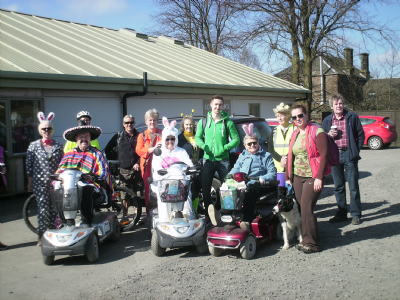 Maria Duncan and friend Bee Henderson, who are both tenants at Bield’s Inchkeith Court retirement housing development in Glenrothes, joined three others from the ‘Rambling Roses (and a Thorn)’ group to take part in an eight-hour sponsored ramble around Loch Leven. The group raised more than £1400 for the Lundin Links-based charity, Homelands Trust-Fife. Maria, who has lived at Inchkeith Court since 2012, said: “The money is being used to help purchase specialist disability equipment for the Trust’s new, luxury self-catering holiday cottages and drop-in centre in Lundin Links. “The buildings are specifically designed and equipped to meet the needs of people with a range of disabilities and long-term health conditions. The facilities are fantastic. I have used them on a number of occasions and this is why I decided to fundraise for them.